Last weekend, when at Gulgong, we took a drive to Coolah Tops. 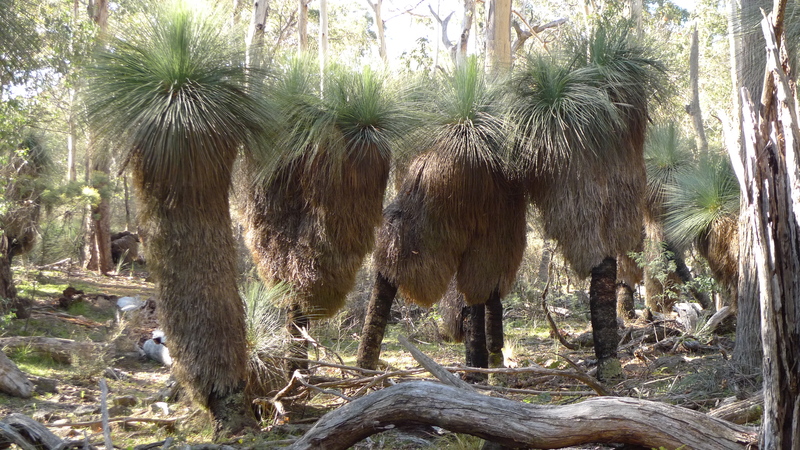 We had to revisit the grass tree colony once we were there. Leaving aside the now (just a bit sadly, I think) proscribed old common name for these plants, there is still something oddly anthropomorphic about them. In part, it’s their sociable habit of growing together. I’m not sure of the exact reason for this – moisture and soil nutrients might be the entire explanation, but it is quite striking. Our visit was all too short. 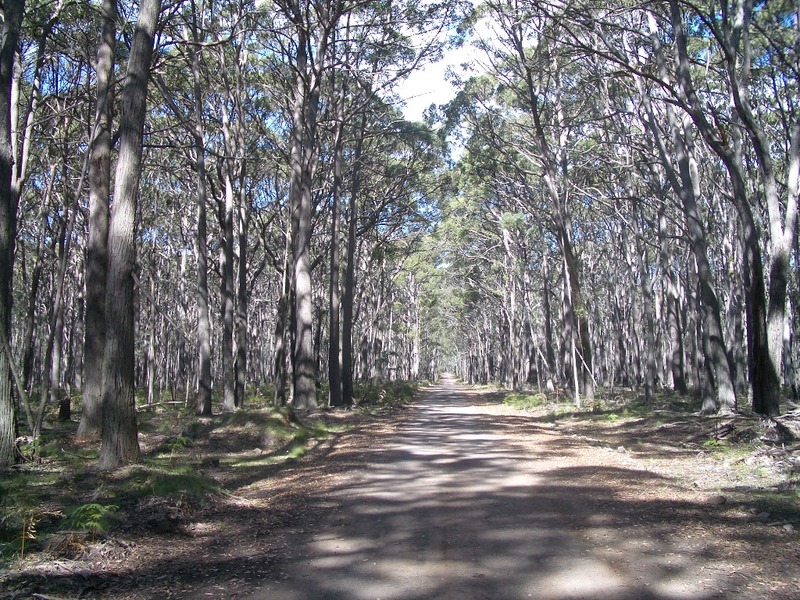 It is still my ambition to spend a longer time at this tucked away and (I’d say) relatively unknown national park. The title is a bit of a half-truth, since in the end we “rode” eastwards at least as much as we travelled westwards, though it is an echo of a (to me) memorable trip over the divide which I undertook one Good Friday some years ago. Starting on Wednesday, D and I travelled west (as you will have guessed). We first drove to spend two nights at one of the the Goulburn River Stone Cottages, about 3 km off the Ulan road, about 10 km past Ulan, which in turn is about 40 km past Mudgee. I have previously been twice to The Drip, a scenic spot about 2 km up the river from this cottage. Now seemed a good time to stay at the Stone Cottages, because the commencement of mining on the Mooraben mineral lease this year threatens the ground water and ecosystem of this area, or so opponents of that mine say. The cottages are a number of “huts” (or so the map described the one where we stayed) in a property, Gleniston, which adjoins the Goulburn River National Park. We stayed two nights. On the day in between, we took a little drive up to Cassilis (not really much to see there, really) and then came back for a skinny-dip (sorry if that is TMI) at a spot in the Goulburn River just upstream from “our” cottage. The cottage itself is a single room hut with a kitchen at one end and sleeping and sitting quarters at the other. The lights are powered by a 12 v solar panel (so no TV or other electrical modern conveniences, which is part of the point); the hot water and fridge (two useful mod-cons) are gas powered. There is a rustically constructed bathroom at the back, for which the water is pumped from the river, so we didn’t need to feel too guilty about bathing, although we were urged to water the surrounding plants with our grey water. We saw some wildlife, though not as much as some others have, judging by the visitors’ books kept at the cottage. The deep quiet and dark (no moon on either night) also vouchsafed us many many stars. One oddity about this is that I found it almost impossible amongst so many to make out the Southern Cross! On Friday to Gulgong, of which I have written before and where a friend owns a house. Here, too, we stayed two nights. On the day in between, we drove again, this time even further, to Coolah and then to Coolah Tops National Park. This is apparently the south-eastern extreme of the Warrumbungles, where they meet the Dividing and Liverpool Ranges. Until 1996, the park was a state forest, and it shows signs of this, but it is still a magical place. The approach, and especially the last 10 or so km up a ridge-top “gravel” (but actually more just extremely stony) road is an adventure in itself. Once there, we took three short walks. The first involved a steep descent to a waterfall and ascent in return. We convinced ourselves that our shortness of breath was owing to the altitude. 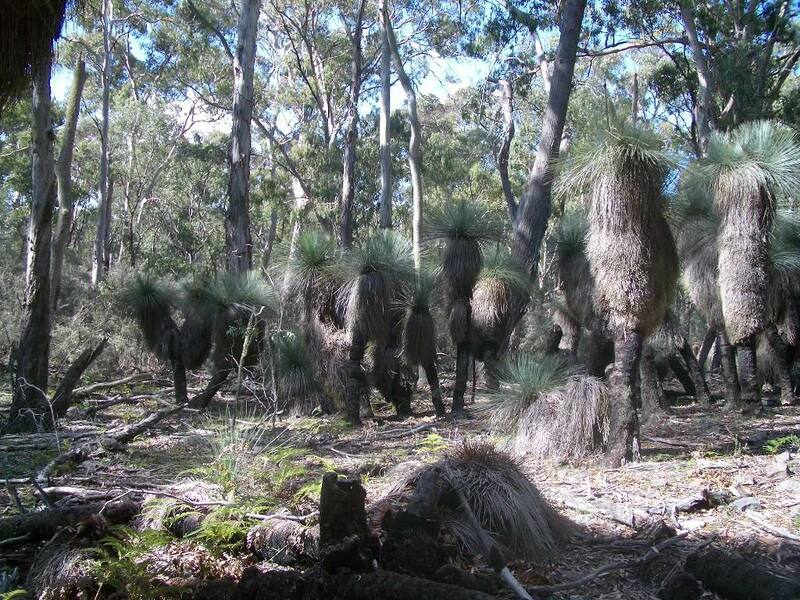 The second was to a very striking stand of giant grass trees. If this hadn’t been level, I would not have been able to persuade D to make it. The third, at the end of the road, was to a lookout known as “The Pinnacle.” This is a narrow basaltic ridge jutting out from a line of cliffs, from which you can look north over the plains. It was an amazing feeling and well worth the journey. I recommend this. One bizarre feature of this walk is that, all of a sudden, miles from the last encountered fence, there is a fence with a little gate (oddly, higher than the fence itself) which everybody apparently opens and then shuts again by means of one of those toggles on a chain which you then slip on to a post with a knob on the end. (If anyone can work out what I mean by this and what the proper term is, I would be indebted.) It reminded me of the lamp-post in Narnia. The most perilous part of the road was not the gravel part up to and in the park, but the bitumen section on the valley floor from Coolah. The road, though paved, had been scarcely made at all, with the result that at some points on one side or other of the road it had simply subsided in a deep rut, leaving a relatively high ridge in the middle of the road. This ridge scraped most alarmingly on the undercarriage of our (admittedly low-set) city car on the one occasion when I imprudently allowed the car to straddle it. After that, I was alert to the problem. On Sunday, back to Sydney, including through enormous ex-hailstone raindrops from about Leura to Penrith. You are currently browsing the archives for the Coolah Tops category.